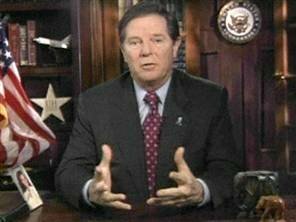 Succumbing to scandal, former Majority Leader Tom Delay has said he will resign from Congress. To my way of thinking this is a good thing. You see, I absolutely hate "DELAYS" of any kind, be they in the emergency room, at the airport, inside the depressing walls of the DMV office or on the streets of Paradise (Lost) here in once-bucolic Bulverde. As a side note I must report that President Bush quickly stated that the Republican Party won't suffer from DeLay's decision to resign. "My own judgement is that our party will continue to succeed because we are a party of ideas."